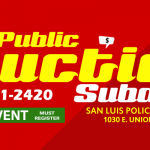 On Saturday April 28th, 2018 starting at 8:00 a.m., the City of San Luis will hold a public auction at the police impound lot located at 1030 E. Union Street, San Luis, AZ. Individuals that are interested in purchasing are required to pre-register at the San Luis Police Department April 27, 2018 starting at 8:00 a.m. to 5:00 p.m. Registration for the live auction can also be done Saturday April 28th from 7:00 a.m. to 7:45a.m. Bidder must be at least 18 years old and present a valid ID. On Friday April 27th, 2018 from 12:00 p.m. to 5:00 p.m., the public will have the opportunity to view the equipment and vehicles prior to the auction. The SLPD wishes to inform the public that over 41 vehicles and other surplus items, office equipment, computers, furniture, washer, dryers, and other miscellaneous items will be sold to the highest bidder during the live auction. The sale of City equipment and/or vehicle(s) is in an “AS IS” condition, with all faults and without warranty. The description of the equipment and/or vehicle(s) offered for sale has been compiled from data available. The City does not guaranty or warrant the condition or quality of the equipment and/or vehicle(s).